as seen in this youth being questioned at Wellawatte. Elections Commissioner Dayananda Dissanayake whose prolonged medical leave set off a controversy during the recently Presidential elections, has returned to the vital office amidst indications that the government is preparing to hold Parliamentary elections within the next few months. Mr. Dissanayake has resumed duties after more than four months of medical leave and replaces D.M.P.B. Dassanayake who came in surprisingly from a Sabaragamuwa Provincial office to serve as Acting Commissioner of Elections for about two months. Meanwhile Election Commission officials and the Government Printer Neville Nanayakkara said last night both of them were prepared for any snap general elections . In this scenario the Elections Commission office is facing a new controversy over the printing of an additional stock of envelopes for the postal voting at the last Presidential elections, a week after the postal voting closed. The Deputy Commissioner, M.C.Arunthavachelvam-one of the figures in the earlier dispute over who conducts the elections- has written to the Government Printer asking him to print nearly 100,000 envelopes for postal votes. The request has come into question as the letter is dated December 16, 1999 -more than one week after postal voting ended. The Deputy Commissioner had said he would furnish a sample of the envelopes and also asked that he be shown the proofs of the envelopes before they were sent for printing. Mr. Dassanayake, who returned to his substantive post as Sabaragamuwa Provincial Secretary on Friday told the Sunday Times he did not wish to comment on the question over the additional envelopes since he was no longer in the Elections Department. Meanwhile sources said the government was likely to draw money through supplementary estimates until general elections were held. Last November's budget was put off and instead the government obtained funds till March through a vote on account. Government plans to conduct a surprise search operation in Colombo city was hampered by information about the curfew leaking to the public in advance. The Tamil daily 'Virakesari' carried a news item on Thursday morning saying plans to conduct a search operation in Colombo and the suburbs under curfew was discussed. However it did not mention dates. The newspaper said, soon after the bomb blast at Flower Road the President called for an emergency security council meeting and had discussed the security crisis in the city. The newspaper said the discussion to declare a sudden curfew took place after the National Intelligence Bureau (NIB) had given details about Tiger infiltration in the city. The efforts to carry out the cordon and search operation in the city were further affected when the Army and Police found it difficult to gather sufficient men for the operation. The Police had to call in personnel from outstations. The Army also had to bring in troops from other camps. During the search operation about 1,500 were detained on Friday but most of them except about ninety had been released by last afternoon. The persons detained are being further questioned. 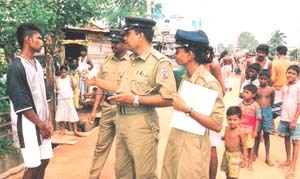 Our Defence correspondent reports that no-LTTE arms caches or hard-core members were detected during the snap curfew indicating they had fled or taken cover. Renuka Shanmuganathan, a sister of Thirukumar Nadesan was taken for questioning yesterday under the Prevention of Terrorism Act. Ms. Shanmuganathan is the wife of S. Shanmuganathan, Managing Director of Union Bank. On Monday President Kumaratunga made repeated references to Thirikumar Nadesan during a TV chat show alleging he was a 'crook' and promised to take action against all 'crooks'. In the aftermath of Wednesday's suicide bomb attack at Flower Road and further threats from the LTTE, Cabinet Ministers have been directed to curtail their public functions in Colombo. PA General Secretary D. M. Jayaratne said the ministers had reviewed the security situation and decided to limit functions in the city but functions elsewhere would continue as usual. "There are indications that a cabinet minister may have been targeted by the Flower Road suicide bomber. We cannot come to any conclusion but as a security measure we have decided to minimise our public functions in the city," he said. The funeral of Tamil Congress General Secretary Kumar Ponnambalam takes place this morning at the Colombo General Cemetery, five days after a lone gunman shot him dead at a lonely spot down a road at the largely Tamil populated Wellawatta. Police investigations have drawn a blank on the assassination, but a group calling itself the National Front Against Tigers has claimed responsibility through a fax sent to media and to the Police through a private communications' office. The fax sent at around 3.30 of the morning after the assassination said the ACTC leader was killed because of his criticism of the Kumaratunga administration and his political support for the LTTE. Political observers believed the actual existence of a group whether by the name of National Front Against Tigers or otherwise, which will target Colombo based sympathizers of the LTTE. They however fear that this group, which may have the backing of certain high-ups in Government may also target individuals who oppose the Government on other issues. Initial reports indicated that a person who spoke in Sinhala and identified himself as, 'Shantha' befriended Kumar Pnambalam, for three to four months recently. It was he who had taken Mr. Ponnambalam to Ramakrishna Terrace on a day the ACTC Leader had planned to stay at home and clear his office room. Mr. Ponnambalam had driven his own Mercedes Benz car. Ms. Yogi Ponnambalam said that she was concerned about this caller 'Shantha' whom her husband had dealings with, but believed that her husband knew what he was doing. There was no trace of this 'Shantha' whom investigators believe may have been the same person who shot Mr. Ponnambalam at point blank range. Ms. Ponnambalam accused the Government of being behind the killing of her husband. She had conveyed her views to P A General Secretary D M Jayaratne. In the meantime President Chandrika Kumaratunga has sent a note of condolence to Ms. Ponnambalam stated that no words can assuage the profound grief and assured that her thoughts are with Ms. Ponnambalam. The message was released to the media through the Government Information Department yesterday. Recently Mr. Ponnambalam had also initiated discussions with the Up Country People's Front Leader P Chandraskeran to form an Anti Government Common Tamil Movement which included the Plantation Tamils. On the day of Mr. Ponnambalam's assassination LTTE suspects who have been jailed at the Kalutara prison rioted. Additional Police teams and more Prison officials have been rushed to the high security Prison at Kalutara after clashes between hundreds of LTTE suspects and jailers left two dead and some 40 injured, a Justice Ministry official said. Justice Ministry secretary M.S.Jayasinghe said yesterday a team headed by the Superintendent of the Welikada Prisons had been rushed to the Prison to bring the situation under control. He said urgent steps were being taken to expedite legal matters regarding the Tamil detainees in the prison, in response to repeated demands that they be indicted if evidence is available or be released. Tamil parties have said hundreds of detainees were being held for several years without trial in violation of their basic rights. The clash began with a protest by the Tamil prisoners in a cell, demanding better welfare and other facilities. While some of the demands were being discussed prison officials had begun searching the cells as they had received information that the inmates were having dangerous crude weapons, Commissioner K. Karaliyadde said. When the search was started, the inmates attacked the prison officials with various weapons. Mr. Karaliyadde said the crude weapons included iron rods, spikes, brickbats, broken door frames, carrom board frames and concrete slabs. The prisoners had reportedly been collecting the items over a long period and had broken the concrete toilet pits to get a large number of the weapons. Seven hundred and ten of the 860 inmates are Tamils, all of who have been taken in under the Prevention of Terrorism Act. TULF Secretary General . R. Sampanthan in a letter to President Kumaratunga after the incidents said most of the detainees should have been released long ago. He said some of the detainees have been held for more than two years, and the cases against them had not even begun. Thirty five inmates and 25 prison officers were injured in the two clashes, and the condition of two of the officers warded at Nagoda hospital was reported to be critical. Kalutara Police Inspector R. Jansen said the second clash on Friday in another section of the prison was apparently a retaliation to the first clash on Thursday morning. Two inmates N. Jesudasan and S. Srikumar died in the clashes. Inspector Jansen said that according to the post mortem on Jesudasan he had died as a result of grave injuries to his skull. Mr. Karaliyadde said he had promised to build a Hindu shrine for the detainees within the next three months, and that Rs. 1,000,000 had already been spent to provide more welfare facilities. Mr. Sampanthan in his letter revealed that the anti harrassment committee appointed by the President had recommended that cases against all detainees be finalised by next month and he hoped this would be carried out. He said the frequency of clashes at the Kalutara prisons suggested that the relationship between the prison authorities at Kalutara and particularly the Tamil prisoners had deteriorated.